From Maker Faire – Sightings of Evil Mad Scientist’s new milled aluminum EggBot Pro #eggbot #makerfaire « Adafruit Industries – Makers, hackers, artists, designers and engineers! Often times the stuff that gets one the most excited at Maker Faire are the things you encounter between booths. A chance encounter with Evil Mad Scientist’s Windell Oskay after the Friday night paella dinner was a chance to see the EggBot Pro “in the metal” and learn about his efforts to take the Egg-Bot project into this new configuration and housing, and learn about how US manufactured gorgeous milled aluminum can be a more affordable route than injection molding in some cases. A number of other attendees (and recent customers) captured the EggBot Pro with better media, like Rick Winscot‘s Vine above! Its major components are solid aluminum, CNC machined in the USA, and powder coated or anodized. It’s sturdy as can be. And, it comes fully assembled and ready to use. Assuming that you’ve installed the software first, you can be up and printing within minutes of opening the box. 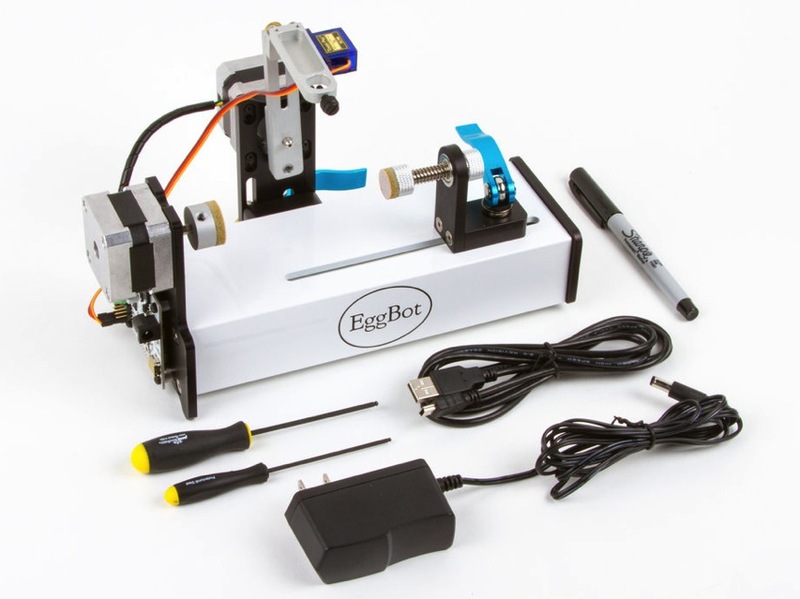 The EggBot Pro fits spherical and egg-shaped objects from roughly the size of a gum ball to that of a light bulb — about 1 to 3.5 inches in diameter (2.5 – 9 cm). Perfect for ping pong balls, golf balls, chicken eggs, and similarly sized objects….